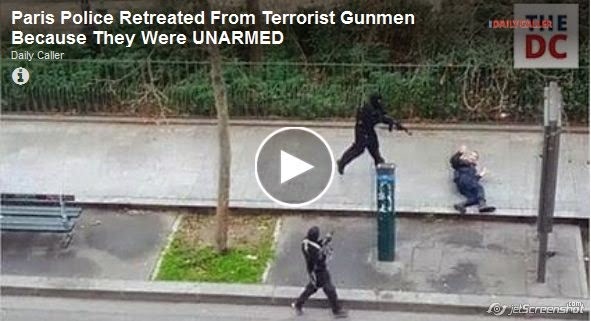 Three Paris police officers who showed up at Charlie Hebdo's Paris headquarters on Wednesday morning retreated because - wait for it - they were unarmed. CBS News also reported — citing a reporter with Britain’s Telegraph newspaper — that the two officers were apparently unarmed. The officers came into contact with two or three gunmen armed with AK-47s after the Islamic terrorists had left the offices of Charlie Hebdo where they had fatally shot 10 inside the building, including four of the magazine’s cartoonists. The terrorists — who were heard shouting “Allahu Akbar” while firing rounds in the streets of Paris and reportedly told witnesses that they were affiliated with al-Qaida — were reportedly angry at cartoons appearing in the magazine which satirized Muhammad. They have the option to carry firearms? You mean as opposed to London where they don't even have the option? What good is an unarmed police officer? Mon Dieu!